I told my friend Jeff about the whole cancer thing and the part that horrified him the most was what the surgery meant for my future eating habits, or lack thereof. The idea that I would not be able to eat many of my favorite foods simply did not compute for him. 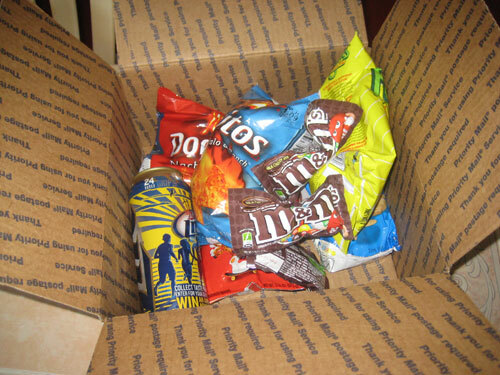 In the mail yesterday I received a box from him containing M&Ms, Chips Ahoy, Double Stuff Oreos, Funyuns, Doritos of multiple varieties, cheetohs, potato chips, and a 24 ounce can of Miller Light. This is a person who knows me. There’s alot ‘o love in that box. Very cool.